In October 2005, two mountaineers climbing above Mendel Glacier in the High Sierra finds the mummified remains of a man in a WW II uniform, entombed in the ice. The "Iceman" discovery creates a media storm which draws author Peter Stekel to investigate and stumble upon the case of a navigation training flight crew missing since 1942. Early attempts at recovery are thwarted due to empty graves, botched records, bad weather, bad luck, and bad timing. Then, in 2007, Stekel himself discovers a second body in the glacier. Through meticulous research, interviews, and his own mountaineering trips to the site, Stekel uncovers the identities of these four young men. 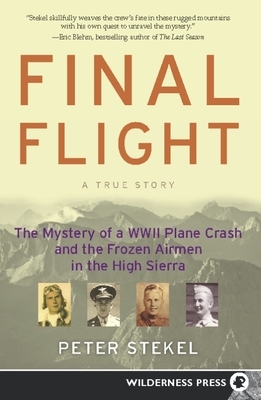 Final Flight explores the story of the ill-fated flight and the misinformation surrounding it for over 60 years. The book is a gripping account that's part mystery, part history, and a personal journey to uncover the truth of the events that occurred on November 18, 1942. In the process, Stekel rewrites the young aviators' last days and takes us on their final flight.